How many homes do you generally build in a year? We typically construct 6-9 large projects per year. Some of these may be large renovations or custom homes, and some are additions. We also enjoy doing smaller projects which can include kitchens, bathrooms, outdoor living areas, etc. What types of homes do you build? 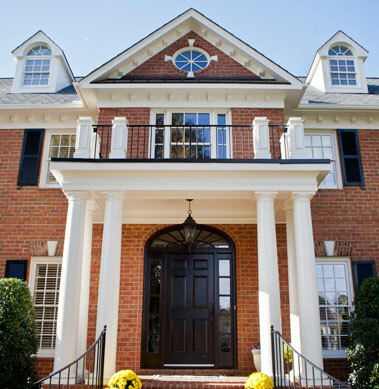 Every home we build is a custom home, and although many of the homes we have built are classic designs, we′ve built a range of architectural styles including Contemporary, Transitional, and Traditional designs. Do you build GREEN and Energy Star rated homes? There are many current regulations that we utilize that already observe best practices with regard to green building and energy star compliance. However, for those clients who wish to really go the extra mile and have their homes rated, we are happy to facilitate the rating process. We have installed Geothermal heating and cooling systems, and we have utilized green building materials such as open and closed-cell (spray foam) insulation, which increases the R-value of the house and also provides long-term savings on energy bills. This type of home insulation provides a healthier and greener option for those who desire to incorporate this feature into their homes. The short answer on green building is that it is not a simple ’green’ or ’not green’ option, but a range of choices that the client will have the opportunity to decide to include in their homes. Often, the greener choices are (at least in the short run) more expensive. We will go as green as the homeowner is willing to go. If the homeowner wants to have the house rated, a process that involves testing and inspections, we are happy to do this and expedite that process. How long does it take, on average, to build a new home? This varies, but generally new custom home construction takes 6 to 10 months. What is a general timeline for major renovations or additions? Kitchen renovations will take 4 to 8 weeks, bathroom renovations from 4 to 6 weeks, and additions of outdoor living areas often run 4 to 8 weeks. Does the client have to move out of his home while renovations are being done? Typically, no. We are very careful in our planning and workflow process to be sure that our work is done in such a way that the homeowners can continue living in the home while we are working.